This day of national independence is celebrated across the country as a day of freedom. Hosting a 4th of July party provides the perfect opportunity to let your personality shine and invite friends and family over to celebrate the freedoms that being American entails. Nothing quite says 4th of July party like a cookout. It’s one of the most common party themes during the summer months. Traditional cookouts serve hot dogs and hamburgers, but you can spice it up a bit with a variety of different meats and special condiments like homemade spicy mustard or hot peppers. If you’d like to go the less traditional route, grill up some shish kabobs or barbecue pulled pork. If you’d rather not cook an entire meal for your party and want to keep it simple, finger foods can be a game changer. Set out sandwiches, chips, dips and the all-time favorite pigs in a blanket. This saves on cooking time and can reduce the interruption of the party that a sit down meal could cause. First things first, you need to decide whether or not you will serve alcohol. If so, consider going with just one or two choices for guests. A cold beer or a glass of wine are nice choices for guests and can help keep the guesswork of who’s drinking what down. Make sure to have soda and water on hand for guests who won’t be drinking. For an alcohol-free 4th of July party, soda, water and juices are nice fall back choices. No 4th of July party would be complete without some fireworks. If you live in an area where bottle rockets and other aerial fireworks can be used safely, set them off just after dusk for a great show. If you can’t use aerial fireworks, supply guests with sparklers, poppers and an assortment of noisemakers. You can also set up American-themed games. Play charades based on people and major events in American history. If you use balloons to decorate, set up a prize system. Place a piece of paper into the balloon and when the party is wrapping up, tell guests to pop the balloons to see if they won a prize. Creating the right look in your home or outdoor party area is key to setting up a fun atmosphere for any 4th of July party. There is more than just hanging Old Glory. Use a red, white and blue color scheme for plates, cups and tablecloths. You can hang paper lanterns on the balcony or patio to create a “bombs bursting in air” look. Do you lack an outdoor space for hosting a festive party? 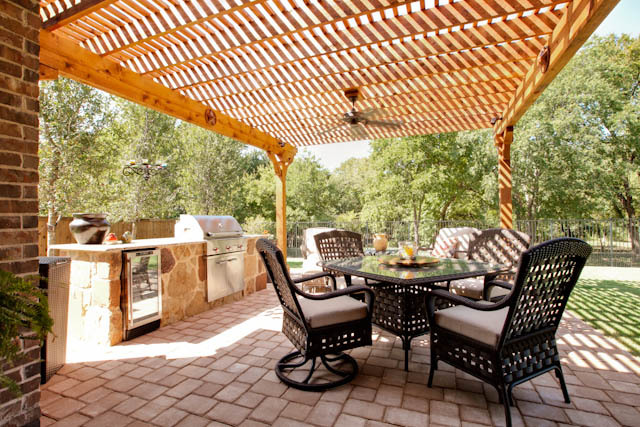 Get inspired by our outdoor living photos.